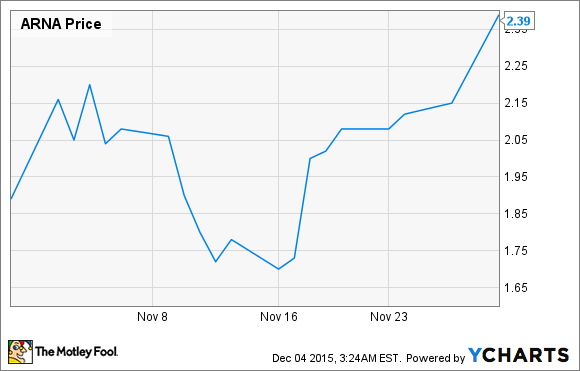 Arena Pharmaceuticals gained 26% in November thanks to two catalysts. Can shareholders expect the good times to continue, or is it time to head for the exit? Shares of Arena Pharmaceuticals (NASDAQ:ARNA), a drug developer focused on a variety of ailments including weight control management, vascular diseases, and autoimmune diseases, surged higher by 26% in November, according to data from S&P Capital IQ. What caused such a dramatic increase in Arena's share price? It appears to be a combination of Arena's third-quarter earnings report and its accepted filing of a new form of lead drug Belviq by the Food and Drug Administration. Arena Pharmaceuticals reported its third-quarter results on Nov. 10, delivering revenue of $9.1 million, including $4.9 million from the sale of FDA-approved weight control management drug Belviq. Based on estimates from IMS Health, prescriptions of Belviq jumped nearly 10% from Q3 2014 to 157,000. Arena also announced a workforce reduction of roughly 80 employees, which is expected to save the company $11 million on an annualized basis. Net loss for the quarter totaled $26.4 million, or $0.11 per share, more than double the $0.05 per share loss it recorded in the year-ago period. However, Wall Street was expecting a wider loss of $0.13 per share, and it seems pleased the company is taking steps to reduce its annual expenditures in the wake of weak Belviq sales growth. The other catalyst that pushed Arena higher was the announcement that the FDA had accepted its new drug application submission for its extended-release, once-daily version of Belviq for weight control management. Currently, Belviq is approved to be taken with or without food twice daily. Presumably, gaining approval in a once-daily format would be more convenient for the consumer and could, in theory, boost sales. If approved, the drug would be marketed as Belviq XR. Can the good times keep rolling for Arena, or is now the time for shareholders to consider ringing the register and running for the exit? My suggestion would be to consider reaching for that doorknob. On one hand, Arena Pharmaceuticals and licensing partner Eisai have been buoyed by weakness in rival Zafgen following the death of a second patient taking Zafgen's experimental weight-loss drug beloranib. Rather than making a person feel full, beloranib works by altering how the body treats fatty acids. Beloranib is now on full clinical hold, which is never a good sign. On the flipside, Arena's Belviq can pretty much be called a flop at this point. Prescriptions were down on a sequential quarterly basis, and physicians and insurers seem unwilling to prescribe or authorize these drugs until long-term cardiovascular studies deems them safe. Price also seems to be an issue with insurers, with coverage only accompanied by steep gross to net discounts. In sum, Arena's Belviq is likely going to continue to be a drag. Arena does have some potential pipeline bright spots with autoimmune disease S1P1 agonist APD334 in midstage studies and ralinepag, a PGI2 agonist, currently being studied in midstage trials for pulmonary arterial hypertension. However, with little chance of profits in the near term and its cash pile dwindling, Arena looks to be a stock to consider avoiding.